We began with a quick trip to the grocery store to pick out the perfect "engine" and "fuel tanks" for this costume. 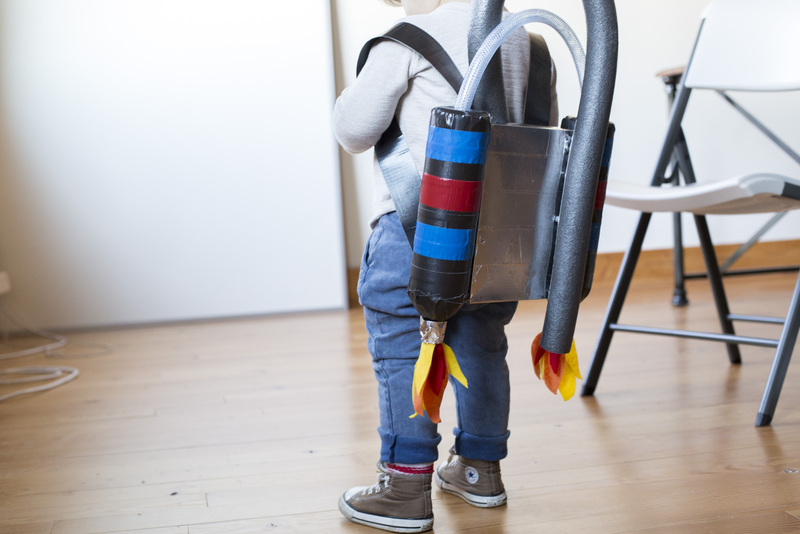 Coordinating these two items goes a long way in making this jet pack look sleek and put together. We picked out two Smart Water bottles and a box of vanilla wafers for our combination. Have all your materials? Good. 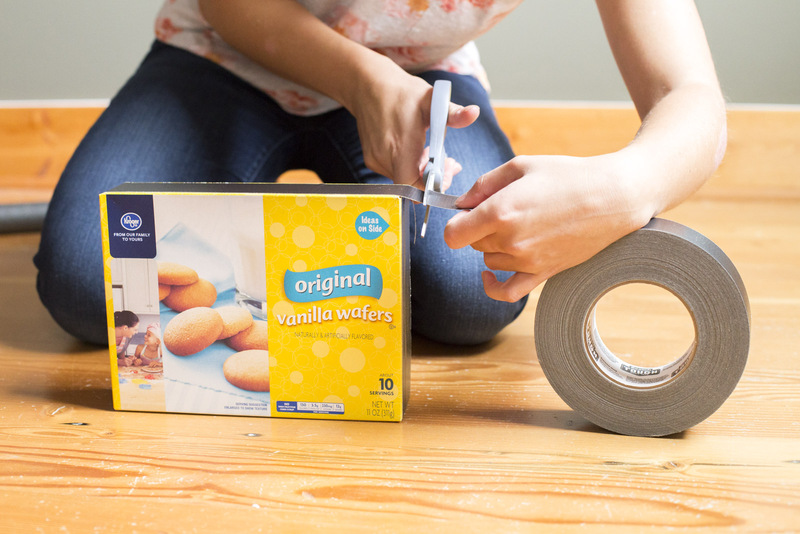 Begin by removing the contents of the box (snacking is allowed); reinforce the perimeter of the box with one long piece of duct tape. 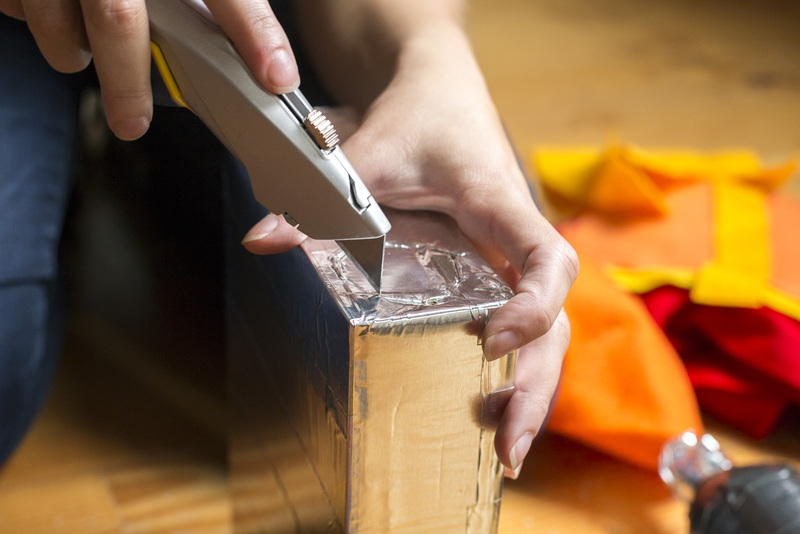 Next, cover the entire box in foil tape. After doing it one way we realized that the best way to do this neatly is to apply tape in strips across the front and back, then to work your way around the edges. Note for working with foil tape: its very sticky and has a tendency to curl back and stick to itself. 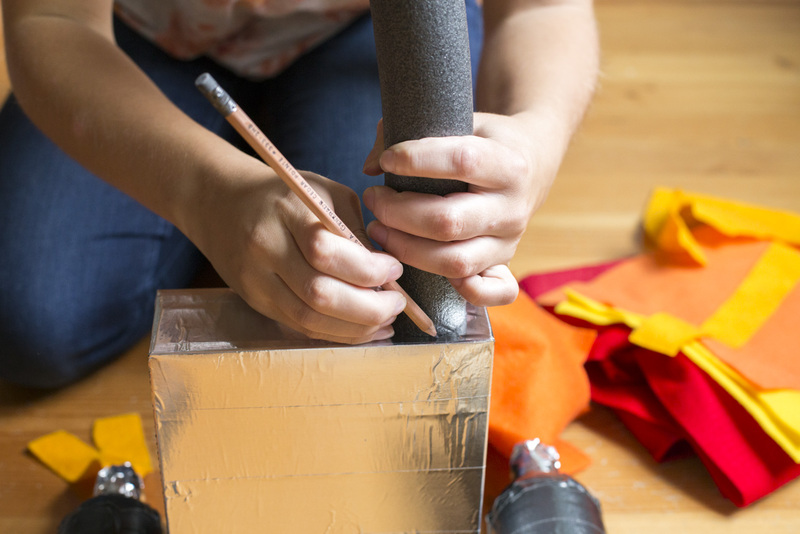 Because it's foil it gets wrinkled very easily (i. e. when trying to unstick it from itself), so keep it as flat as possible while working. Empty your bottles of water (drinking is always a good way to do this) and discard the caps. These will be the fuel tanks for the jet pack. With black duct tape cover the whole surface of the bottles. Begin by taping an "X" over the bottom. 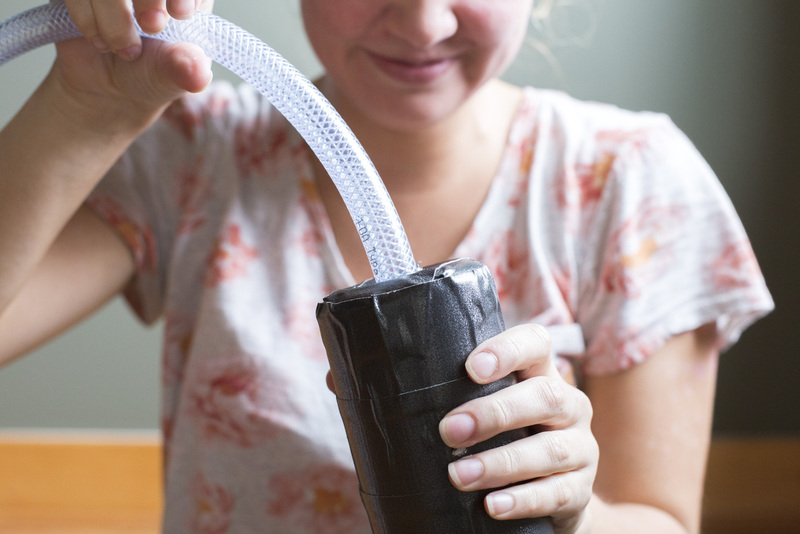 Next, cut the duct tape into small pieces and wrap, one row at a time, around the shaft of the water bottle. This process is easier to keep smooth, flat, and even than the spiral wrapping technique. 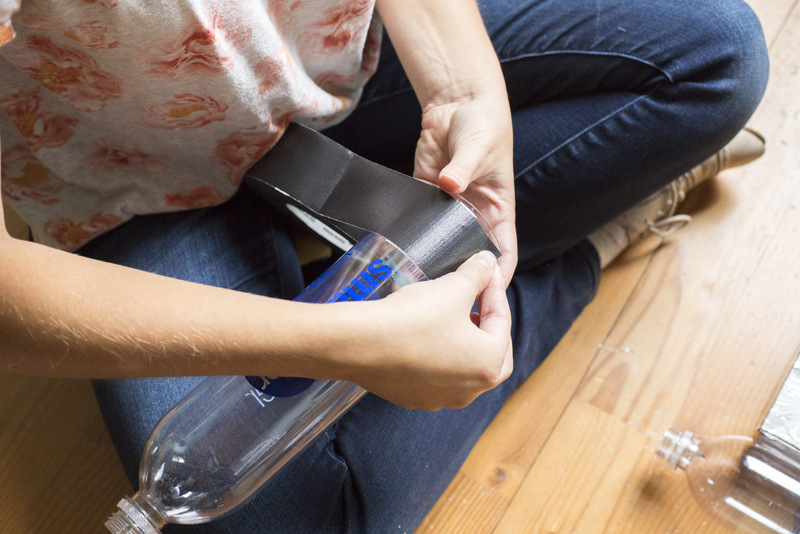 For the curved top of the water bottle, cut the tape into triangles so that each piece can lay as flat as possible without puckering. 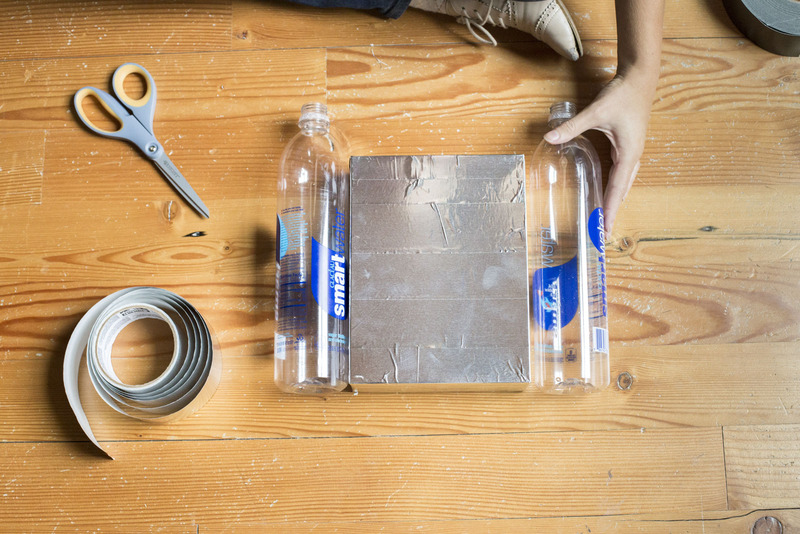 Cut a small piece of foil tape to the right width to wrap around the opening of the water bottle. This likely won't look perfect, but with a little pinching in the right places a crinkled effect that looks intentional can be created. Next comes the tubing for the fuel tanks. 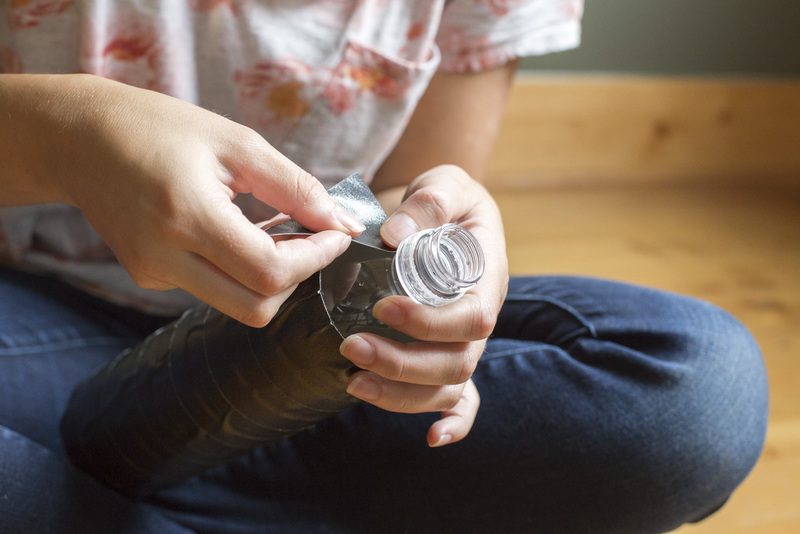 With a 3/4" drill bit and a steady hand, slowly drill through the bottom of both water bottles. Insert the 1/2" braided tubing into the holes. With enough tube inside the bottle it will serve as an anchor to itself and gluing will be unnecessary. 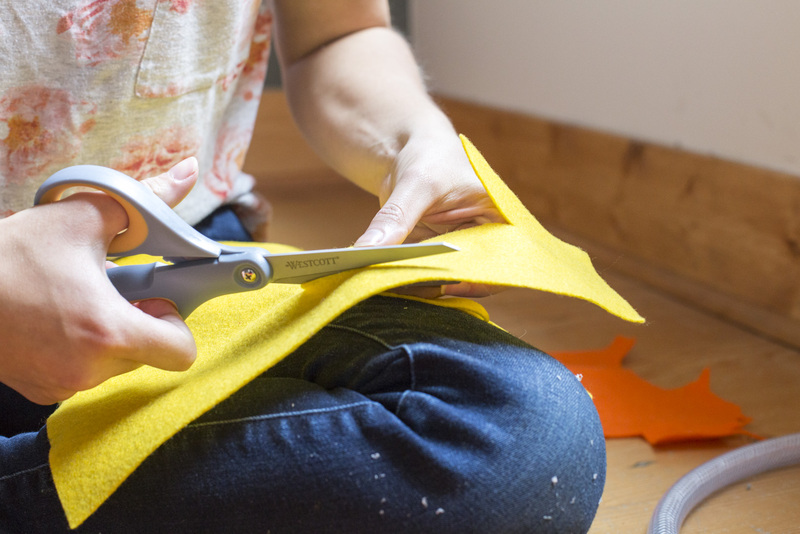 Determine how much tubing you want showing and trim as desired with a sturdy pair of scissors or a utility knife. 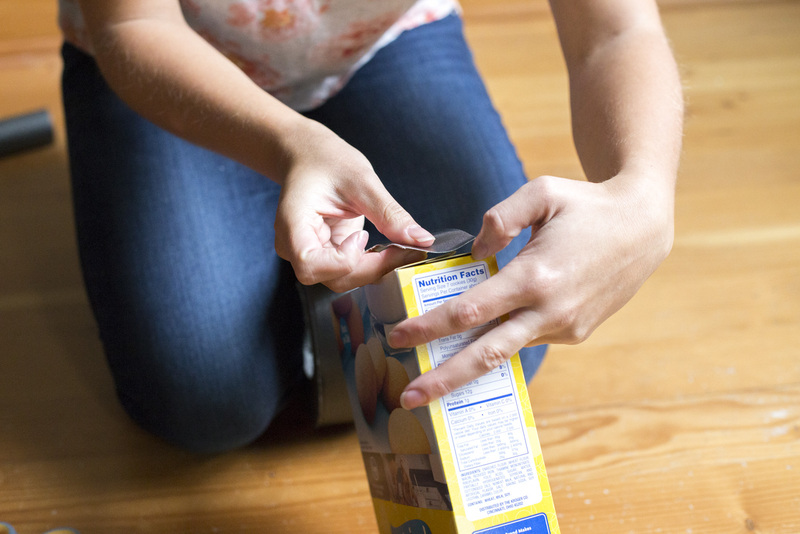 Use WD-40 to clean any residue from the tape off of your spade bit. Use colored duct tape on the fuel tanks and the engine of the jet pack to create your own unique look. 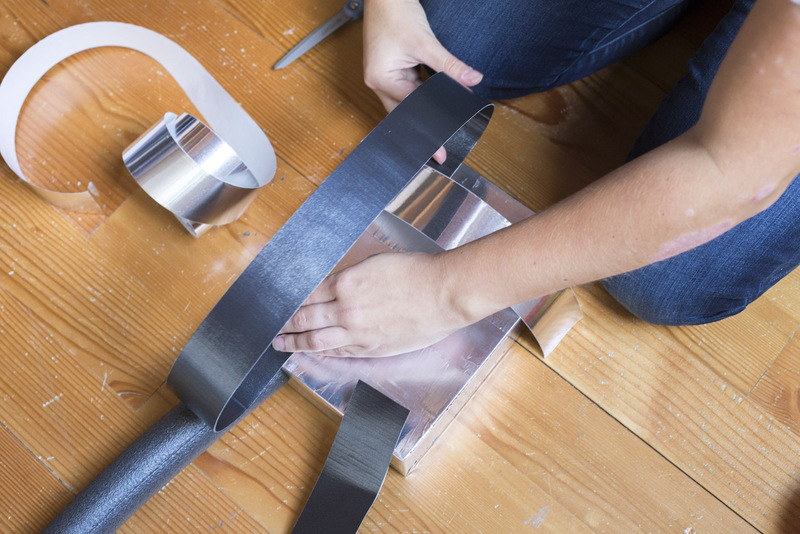 Metallic spray paint on the tube or insulation is another option for switching up the look. Whatever you do to decorate, have fun with it! 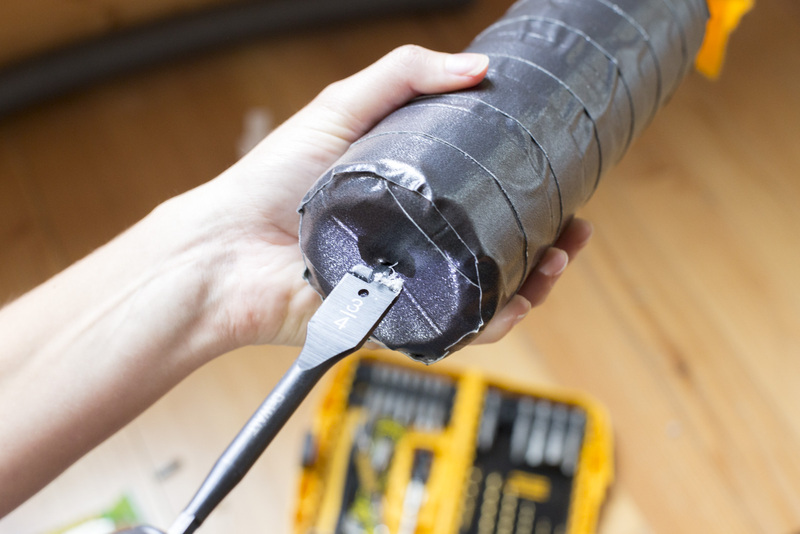 Now, plug in your hot glue gun to warm it up. Cut out yellow, orange, and red flames out of the felt. To mimic the look of fire cut the yellow flames bigger than the orange, and the red smaller. 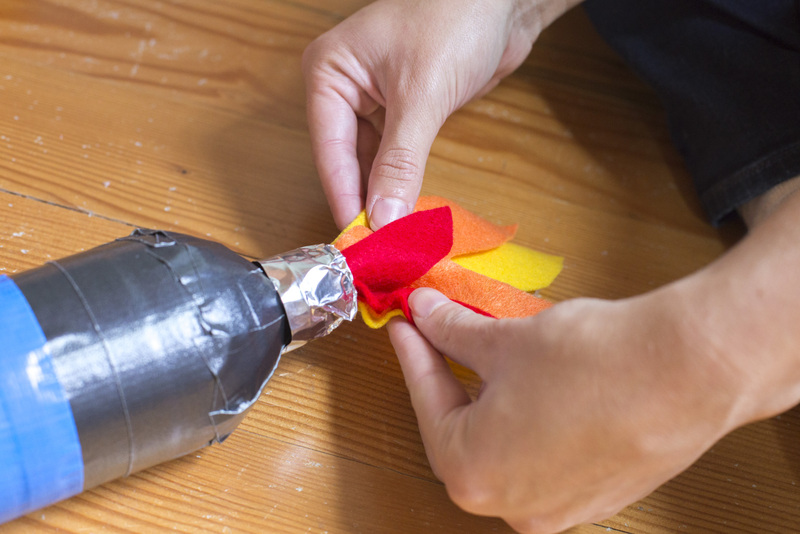 With a hot glue gun attach the felt together and then glue the flames inside the opening of the water bottle. 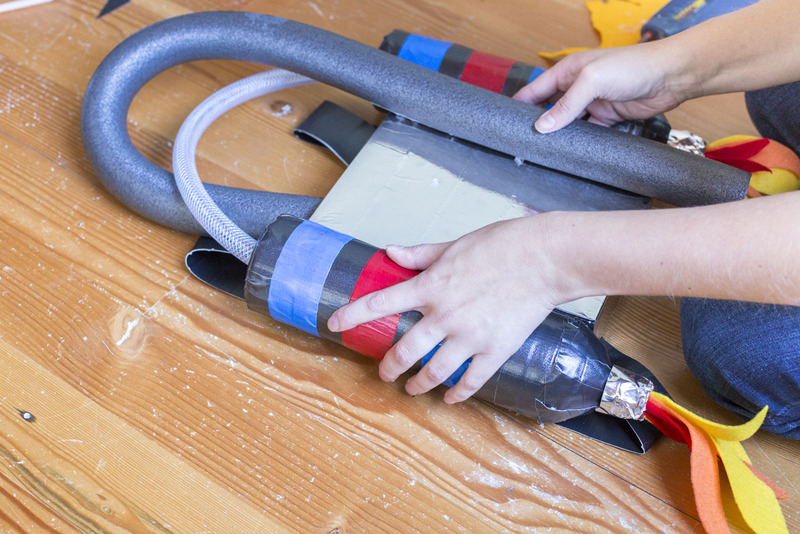 Position the 1/2" pipe insulation on the top of the jet pack and trace a circle around it with a pencil. 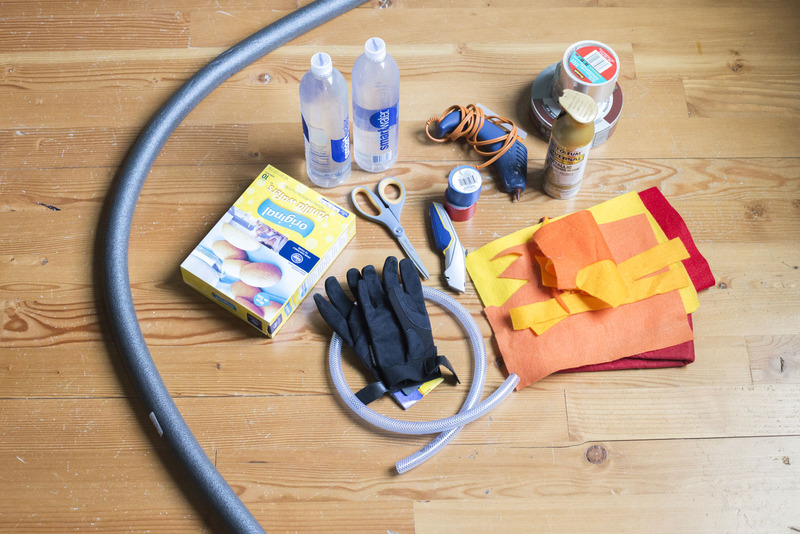 Use a utility knife to cut out the circle and insert the foam tube. 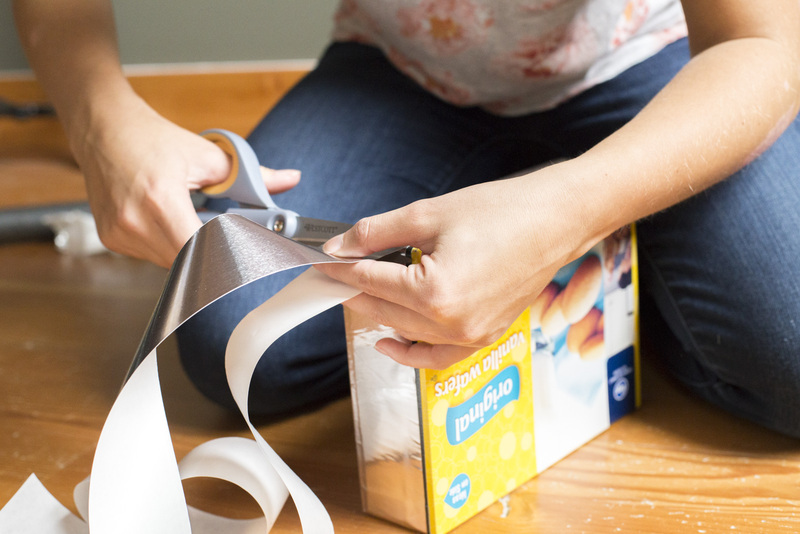 Push down until the tube hits the bottom of the box, this will help anchor it and keep it upright when you bend it. 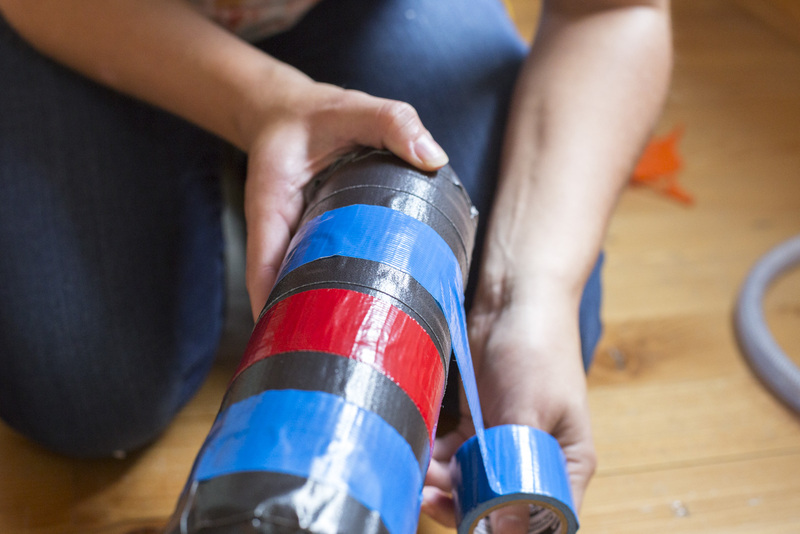 To make the straps for the jet pack tape two long pieces of duct tape together and trim off any sticky edges. Position straps on back of jet pack and tape down the top part with duct tape. We tried using foil tape, but it lasted all of two minutes on a child: the duct tape holds much better. 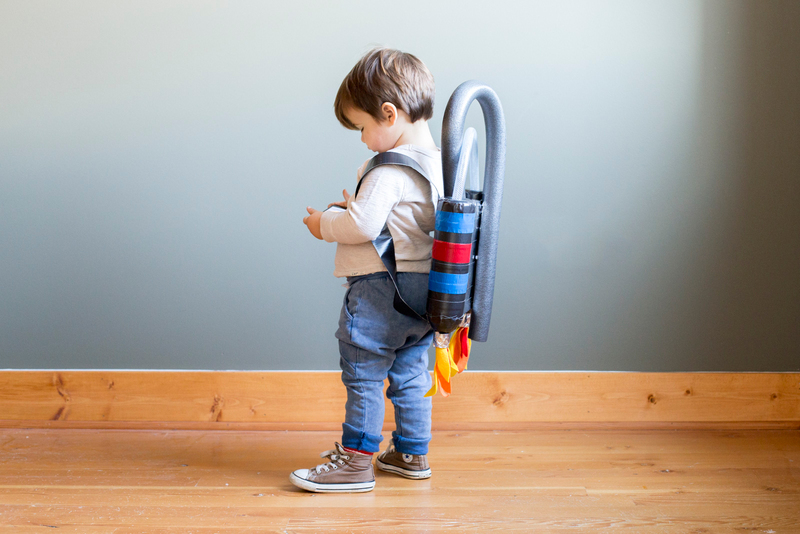 Try costume on your child to determine the length of the straps before taping down the bottom ends. Now for gluing everything together. 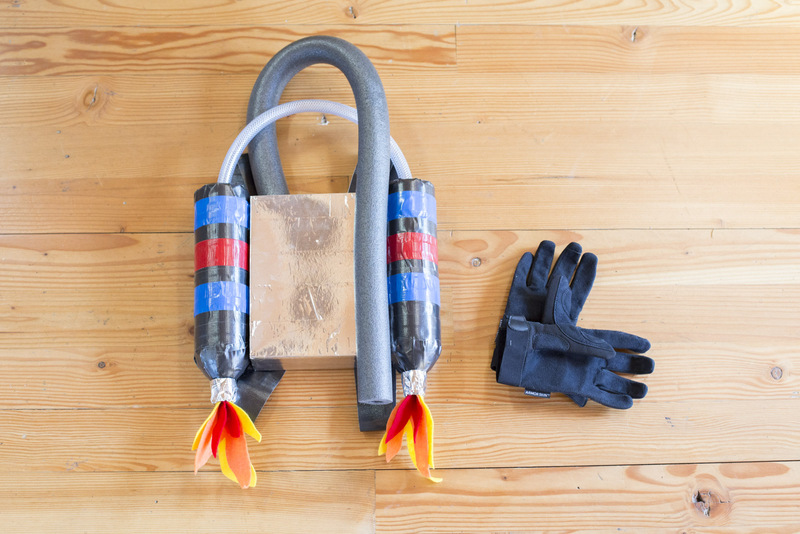 Plug in your hot glue gun again and secure fuel tanks to the jet pack engine. Next attach foam tube to front of pack. Hot glue, we discovered, will melt the foam of the tube. So here's two alternatives: 1) grab some super glue, or other strong glue to secure or the tube, or 2) attach a piece of duct tape to the back of the foam tube, apply the hot glue to the tape and secure (this is what we did and the bond turned out surprisingly strong). Last step: accessorize. We love this costume piece because it's so versatile. In actuality it doesn't need any accessories. Paired with some under armor it could be a "from the future" costume; with some boots, white clothes, and gloves it's an astronaut costume. Or if you want to go all out with the DIY fun, take a look at this costume! This cedar caddy keeps everything neat, tidy, and in one place—and it has the added bonus of looking (and smelling) great. Spring is just around the corner, so it's a great time to spruce up your front porch. We recommend this super cute wood stake door mat. Keep the rain, mud, and muck out of your home in style!